Hello friends! It's Karla back today with a sweet Valentine card for a friend using the Penguin With Heart digital stamp. One of the great things about digi stamps is the ability to easily and quickly resize, creating a cute little friend for this guy! Another bonus is instant gratification - click and print! I decided to create an easy z-fold card that looks like it's super fancy 😉 I added patterned valentine papers from my stash and a diecut heart before layering on this sweet little pair coloured with Prismacolor and Copic Markers. Here are the instructions to make the base: Cut a rectangle 4"x12" long and score it at 4" and 8" and fold it back and forth. 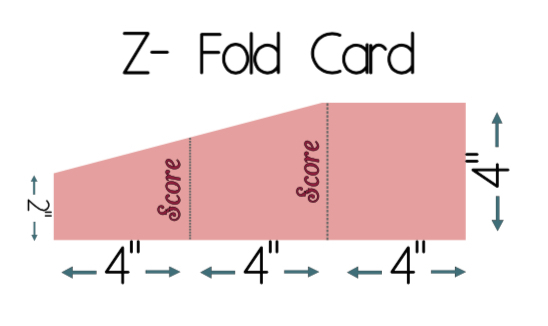 Cut a diagonal line from the 4" fold at the back to a mark 2" down on the front of the card. 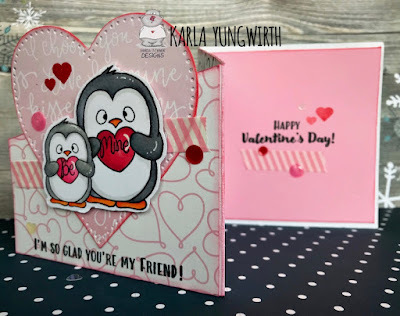 Along the bottom of the card and inside I used sentiments from the Gerda Steiner Designs Valentine Penguins Clear Stamp Set. I love combining stamp sets!! I used a stamp set from my stash to add a little love message inside the penguins' hearts. The stamped hearts are from the GSD clear stamp set as well, and I added a few more sequins and some washi to complete my card. 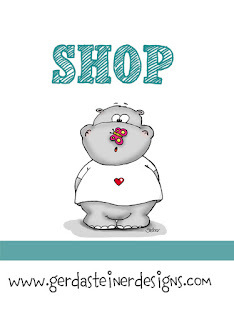 This is going to be a great card to pass along to a special friend! Love it!!! Soooo cute and sweet!